The Sun Shines Sooner… Simplify. Simplify. That’s my mantra these days. I want to spend more time with family and friends and less worrying about deadlines. 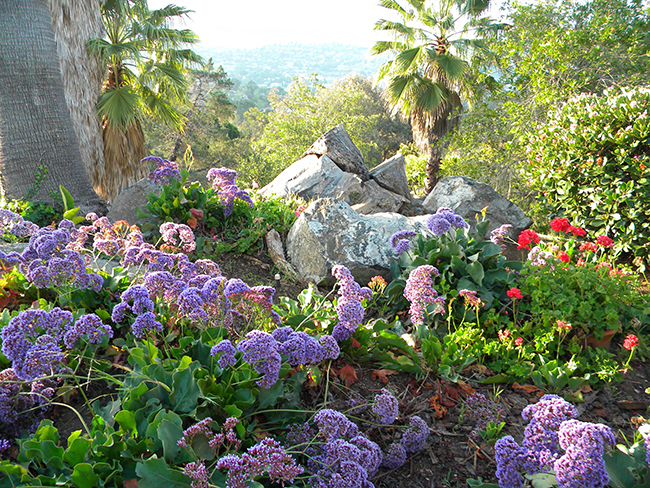 I want more time to walk the hills of La Mesa, and finish great books recommended by my book clubs. To write stories for my grandchildren, and devote more time to volunteering. So, although I may occasionally write an article for the paper, this will be my last monthly column. The piece below ran in the inaugural edition of the La Mesa Courier, issued Friday, June 3, 2011. It explains something about my attachment to this community and one of my favorite things about living here. My feelings haven’t changed in the four years since I began editing the paper (and writing a regular column); if anything my admiration for the people of La Mesa, and appreciation for the quality of life here has increased. I just need more time in my garden. A few years ago, after our youngest son graduated from Grossmont High School and left for college, I convinced my husband to sell the big family house (in La Mesa) and move downtown to a high-rise condo near Balboa Park. And while there were many great things about living there, I found myself returning to La Mesa to run errands that could easily have been completed closer to the condo. I eagerly looked forward to summer gatherings in La Mesa friends’ backyards, and meeting with our book club each month in a different La Mesa home. I missed running into people I knew at the grocery store and in restaurants. In short, I was homesick for La Mesa. So my husband, resembling something like a saint at this point, agreed that we should move back. We had sold the family home but found another just right for us. Most of the people my husband Ted works with live in North County, and they don’t understand why he would want to live where we do, when all the growth (new development) and excitement (in their view) seems to be along the I-5 corridor. As an introductory piece for the paper, I decided it would be fun to interview and photograph up to 20 people who live in La Mesa and ask them to tell me one favorite thing of theirs about La Mesa. The answers were varied but always spoken with surprising passion. Of course I understand and agree with every one of their answers.